Stepping Stones is a nonprofit, United Way partner agency serving the Greater Cincinnati disability community. Stepping Stones currently has summer food service and maintenance job openings to support overnight programming our Camp Allyn location in Batavia, Ohio. 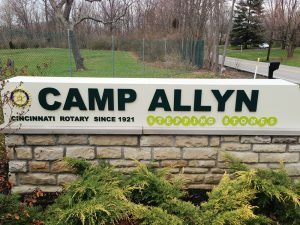 Camp Allyn is a scenic 47-acre property with five accessible sleeping lodges, three lakes for waterfront activities, an outdoor pool, program spaces and a commercial kitchen professionally staff and equipped to accommodate special dietary needs. During the summer months, Stepping Stones’ Camp Allyn is home to an Overnight Staycation program for teens and adults with developmental disabilities. Our Maintenance and Food Service staff support the Overnight Staycation program and help us ensure a positive experience for all the individuals we serve. Would You Like to Join our Summer Team? Browse Food Service and Maintenance job openings below and click the “Apply Now” button in the sidebar to submit an application online. Summer camp position working approximately 35 to 40+ hours per week beginning in late May and ending in early August at Stepping Stones’ Camp Allyn in Batavia, Ohio. (Near Eastgate) Candidates also may have the possibility of part-time weekend hours during the fall, winter and spring seasons. Cooking and preparing food for individuals with disabilities under the supervision of the food service manager. Washing dishes, cleaning, serving food and assisting with setup for outdoor cookouts as needed. Previous experience in kitchen tasks preferred or the ability and willingness to learn. The desire to make a difference in campers lives by providing an outstanding experience. A summer camp position working approximately 35 to 40+ hours per week beginning in late May and ending in early August at Stepping Stones’ Camp Allyn in Batavia, Ohio. (Located near Eastgate.) Candidates may have the possibility of part-time weekend hours during the fall, winter and spring seasons. A good attitude and willingness to learn will go a long way in the selection process for those with less experience. Provide general and specific custodial duties as assigned and as needed. Provide light maintenance duties including, but not limited to, cutting grass, trimming, painting, fixing fences, etc. High school diploma or its equivalent and at be at least 18 years of age.